Ormoc (124.605E 11.009N) was a fishing village on the west coast of Leyte. It had a small harbor with limited facilities, including a concrete and pile pier capable of berthing a ship with not more than a 16' (5 meter) draft and two smaller vessels. The U.S. built a primitive airstrip here just prior to the outbreak of war, which the Japanese were happy to take over when they invaded. Camp Downes, an important Phillipine Constabulary camp, was located about a mile southeast of the town. Ormoc became the debarkation port for Japanese reinforcements to Leyte following the American invasion on 20 October 1944. By 1 November 30 and 102 Divisions had joined 16 Division on Leyte, brought in on destroyer runs reminiscent of the Guadalcanal campaign. These three divisions came under the command of 35 Army (Suzuki). Eventually 1, 8, and 26 Divisions would also be committed to the struggle. However, the Americans continued to slowly tighten the noose around Leyte. On 11 November 1944, carrier strikes sank four destroyers, a minesweeper, and five transports along with 10,000 troops from a Japanese reinforcement convoy. 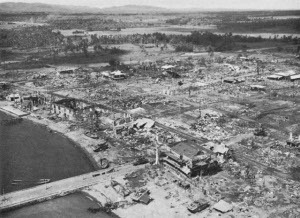 This disaster ended Japanese efforts to convoy major reinforcements to Leyte, but the troops already on the island continued to resist strongly, even mounting a series of counterattacks beginning on 26 November. Smaller groups of reinforcements continued to come ashore until 19 December. Faced with a stalemate ashore, Krueger tried an amphibious end-run using shipping that was awaiting the postposed Mindoro invasion. On 7 December, Struble landed 77 Division just south of Ormoc against negligible opposition. The Japanese were caught off-balance, with 26 Division having moved south to engage 7 Division, leaving only service troops and a single depleted battalion in the area. The Japanese ordered 12 Independent Regiment, which had been assembling northeast of Ormoc, to move into the city. A single battalion of the regiment, which had just arrived in Ormoc, was to hold the Americans long enough to let the rest of the regiment get into position. However, while the Japanese put up stubborn resistance at Camp Downes, they were overwhelmed before 12 Independent Regiment could arrive, and Ormoc was taken on 10 December. The next day 77 Division joined up with 7 Division coming up from the south. American casualties were 123 killed, 329 wounded, and 13 missing while the Japanese lost about 1513 men, including 7 taken prisoner. During the landings, a Japanese reinforcement convoy of six transports and seven escorts was spotted approaching the area. This was heavily attacked by 56 P-47 fighter-bombers, which claimed four ships sunk without loss to themselves. The Japanese replied with sixteen separate kamikaze air raids on the American assault shipping. Though about 36 of the 45 to 50 attackers were shot down, those that broke through the fighter cover damaged five ships. Destroyer Mahan and fast transport Ward were so severely damaged that they were later scuttled.